After week 11 of the college football season, the selection committee for the playoff has only one SEC team in its top 4. Undefeated Mississippi State tops the rankings, but TCU jumped over Alabama for the 4th and last playoff spot. Is the strength of the SEC finally catching up with the conference? After week 11, four of the top six teams in my team rankings hail from the SEC West. All 7 teams are in the top 20. As these teams beat each other up, it seems doubtful any team will have few enough losses to make the playoff. However, the numbers suggest the SEC will most likely get 2 teams in the playoff. Let me explain. Mississippi State has enjoyed a magical season in which they remain undefeated and QB Dak Prescott has shot up the Heisman polls. However, life gets more difficult as they travel to Alabama this weekend. Alabama looks like the most balanced team in the nation. I rank offense and defense by taking yards per play and adjusting for schedule. Alabama has the 7th and 2nd ranked offense and defense respectively. Miami, a team discussed later, is the only other team with two top 10 units. In contrast, Mississippi State has the 9th ranked offense but the 37th ranked defense. Quarterback Blake Sims and the Alabama offense should get their points against this defense. 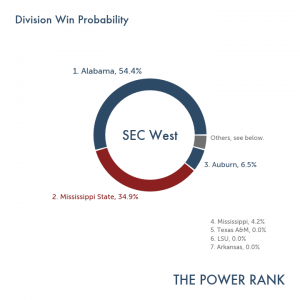 In The Power Rank’s ensemble predictions, which aggregate a number of predictors, Alabama is an 11 point favorite to beat Mississippi State. The markets started by favoring Alabama by 7, but this spread jumped to 9.5. However, a Mississippi State loss does not eliminate them from the college football playoff. They could still win the SEC West since Alabama must play a tough Auburn team in two weeks. 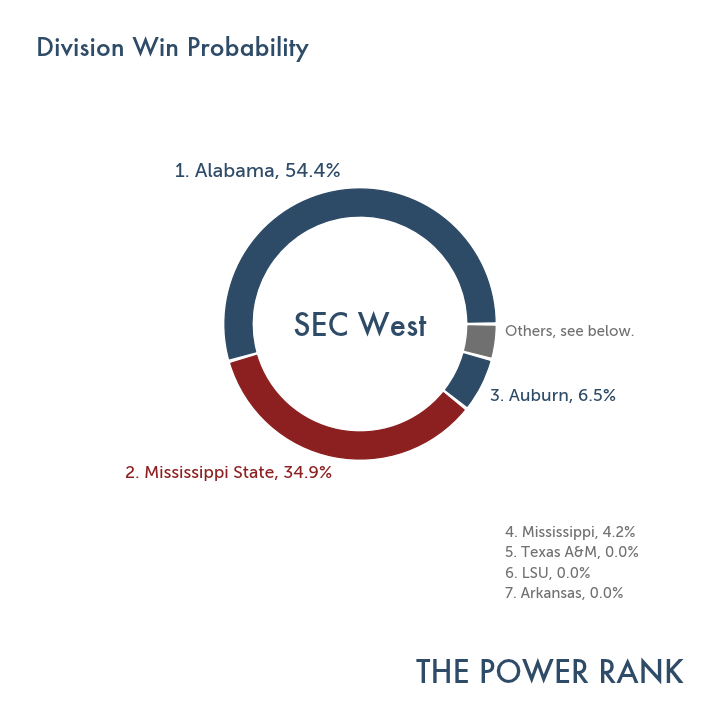 Overall, Mississippi State has a 34.9% chance to win the SEC West. But Mississippi State doesn’t have to win the SEC West. If they lose to Alabama, they will drop in the committee rankings but perhaps not too far. Remember, this would be their first loss, and the committee might keep them in the top 4. If Mississippi State wins their remaining games but finishes 2nd to Alabama in the West, they won’t play in the SEC championship game. But this is a good thing. The selection committee drops teams after a loss, just like the polls. This means it’s bad to lose late in the season. Mississippi State can’t lose the last week of the season if they don’t play. We saw this type of phenomena in the BCS era. In 2011, Alabama lost to LSU during the regular season and finished 2nd in the SEC West. They stayed at home the last week of the season but earned the second spot in the national title game over Oklahoma State. The SEC East could also have huge implications for the selection committee. This weekend, Auburn travels to Athens for a game against Georgia. Both teams feature high powered offenses that should score plenty of points. Georgia gets running back Todd Gurley back for the game. This is one factor that drove the markets to open with Georgia as a 2.5 point favorite. However, you have to wonder how much impact Gurley will have when his backup Nick Chubb has averaged 6.7 yards per carry. Our ensemble predictions give Auburn a slim 0.5 point edge on the road. Despite trailing Missouri in the SEC East standings, Georgia (7-2, 5-2 SEC) has a 49.4% chance to win the division. This probability will only go up if they beat Auburn in their last SEC game. Missouri (7-2, 4-1 SEC) still has 3 conference games, two against tough SEC West opponents (Texas A&M and Arkansas). If Georgia wins the East, they will most likely be a significant underdog in the SEC championship game. However, Georgia almost certainly makes the playoff if they win the game. The current 15th ranked team in the committee rankings would have earned a top 4 spot, which will make it even more impossible for the committee to determine the top 4 teams. Here are a sample of the ensemble predictions I’ve been working on with Mike Craig, my partner in the prediction service. The first number gives a predicted point spread, and a negative number implies a win for the home team. The second number is the total points scored. Florida State at Miami (FL): -2.1, 59.1. Nebraska at Wisconsin: -6.6, 54.9. Michigan State at Maryland: 8.0, 55.3. Rice at Marshall: -22.2, 63.5. Indiana at Rutgers: -7.1, 60.5. Memphis at Tulane: 10.6, 45.6. Akron at Buffalo: 4.2, 54.9. Missouri at Texas A&M: -7.2, 56.2. Toledo at Northern Illinois: -1.0, 64.9. San Diego State at Boise State: -15.6, 53.2. Virginia Tech at Duke: -3.5, 45.4. Texas at Oklahoma State: -0.9, 45.7. Wake Forest at North Carolina State: -16.8, 43.4. Mississippi State at Alabama: -11.0, 55.7. Temple at Penn State: -13.3, 38.8. Auburn at Georgia: 0.5, 66.7. Ball State at Massachusetts: -2.4, 60.4. Miami (OH) at Central Michigan: -11.6, 49.3. Southern Miss at UTSA: -8.3, 47.4. North Texas at UTEP: -1.2, 51.2. All of these math predictions are available to members of The Power Rank. Note from Ed: This is a guest post by Chad Peltier. Raised by an Ohio State fan but a graduate of the University of Georgia, Chad spends his spare time uncovering the deepest mysteries in football analytics. Despite Alabama’s past stranglehold on the SEC (and college football in general), the SEC should be home to one of the tightest, most intriguing races in the country this season. The numbers suggest that Alabama should remain the favorite, but a crop of other teams will challenge the Tide for supremacy. Texas A&M – with or without Manziel – LSU, Georgia, South Carolina, and Florida all have excellent shots at dethroning Nick Saban in the last year of the BCS. For more on how the win probabilities are calculated, click here. Let’s break down both divisions, starting with the East. The front end of the SEC East should be extremely familiar, with Georgia, Florida, and South Carolina vying for their ticket to the SEC Championship game. The Power Rank estimates a 92.7% chance that one of these three teams will win the SEC East. East win probability: 27.6% (3rd). SEC win probability: 9.7% (5th). Will Muschamp will field a talented but inexperienced squad in 2013, which includes a devastated secondary (losing Matt Elam and Josh Evans) and linebacker units (losing Jonathan Bostic). Much depends on Jeff Driskel’s development in the passing game. Senior receiver Andre Debose was injured and is now out for the season, so new wide receivers coach (and former Kentucky head coach) Joker Phillips has his work cut out for him. East win probability: 29.8% (2nd). SEC win probability: 10% (4th). The Gators’ Cocktail Party rivals lost all but four defensive starters to graduation and the NFL, but it’s simply a matter of reloading the already stockpiled talent at Georgia. The top-end talent is unbeatable on both offense and defense at Georgia, but the question is whether the depth at a few key positions – offensive line, linebackers, and the devastated secondary – can handle the long grind of physical games against USC, Florida, and (potentially) Alabama. Reports from fall camp suggest that the offensive and defensive lines are deeper this season, with veteran players finally joining the game rotation. The offensive line will be anchored by five-star recruit John Theus, seniors Kenarious Gates and David Andrews, as well as newly eligible Kolton Houston. Star tailbacks Todd Gurley and Keith Marshall should have plenty of space to run behind this star line, while senior quarterback Aaron Murray will have the time necessary to target one of the deepest receiving cores in the country. East win probability: 35.3% (1st). SEC win probability: 11.7% (3rd). The final challenger in the East is South Carolina. Spurrier’s Gamecocks aren’t just a vehicle for creating Clowney highlights (though that wouldn’t be a terrible thing), but have been one of the most consistently good (but not great) teams in the SEC over the past four seasons. Clowney loses his fellow defensive end Devin Taylor to the NFL, as well as four of five top running backs, three of the top four receiving targets, the top five linebackers, as well as the stud safety behind them, D.J. Swearinger. Spurrier has work cut out for him this season, but it’s impossible to discount how stable Spurrier has kept his Gamecock ship the past four seasons. Missouri and Tennessee look fairly similar as middle-of-the-road teams on paper. Tennessee first year head coach Butch Jones will attempt to find the cure for the Volunteers poor turnover margin the past few seasons. Missouri must turn its penchant for explosive plays in to some measure of offensive consistency. Dorial Green-Beckham will pace a deep receiving core that will attempt to reclaim the numbers from when Missouri was in the Big 12. 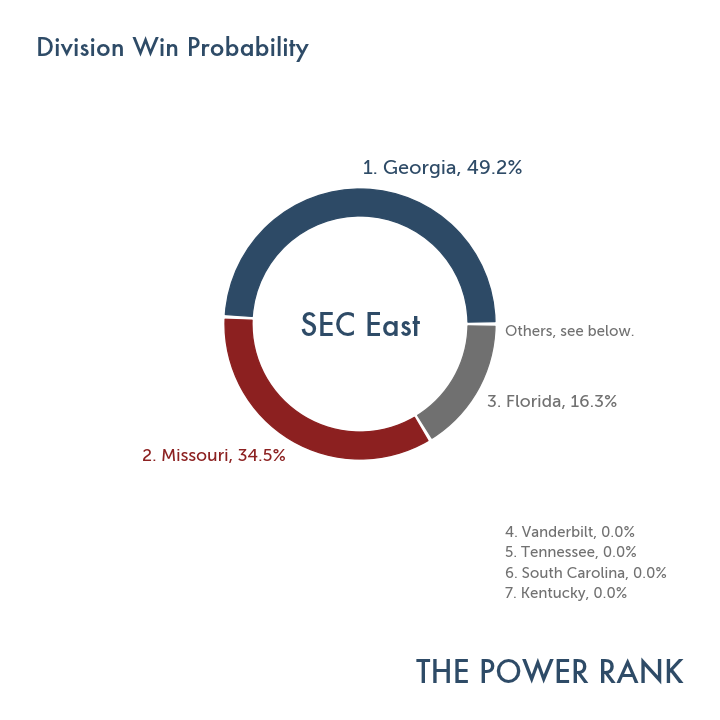 Missouri and Tennessee have a slim chance to win the SEC based upon The Power Rank estimates, with a .5% and .4% win probability overall and a 3.4% and 2.8% chance to win the East respectively. Meanwhile, Vanderbilt’s already poor run defense will be hurt by the loss of the top three defensive tackles. Coach James Franklin has Vanderbilt playing its best football in the history of the program. But this is a critical year as Vanderbilt attempts to break out of the SEC cellar and into the middle of the road group of SEC teams. This is likely not the Commodores year, with a .1% win probability for the SEC and just a 1% chance of winning the East. First year coach Mark Stoops has his work cut out for him at Kentucky, the reigning basement dweller in the SEC. UK brings a legacy of both underdeveloped and shallow depth as well as a negative turnover margin that will likely frustrate Kentucky fans until Stoops’ surprisingly good recruiting classes get on campus next year. Kentucky has close to no chance of winning the SEC (0.0%) and only a .1% chance of winning the East. While the SEC East is fairly evenly divided between great, middle, and poor teams, the West is more stratified. The top three overall SEC teams should reside in the West, including Alabama, Texas A&M, and LSU. However, Ole Miss is certainly doing its best to enter this group under second year head coach Hugh Freeze. West win probability: 62.2% (1st). SEC win probability: 46.7% (1st). Alabama remains the obvious leader of the Western triumvirate, but it is nonetheless striking how dominant the numbers suggest that the Tide will be in 2013. In The Power Rank’s preseason rankings, the margin between the Tide and the second ranked Aggies (7.5 points) is larger than the difference between the second and seventh-ranked SEC teams (4.8 points). QB AJ McCarron led one of the most surprisingly efficient offenses in the country. He only threw three interceptions while remaining explosive with receivers Amari Cooper, Kenny Bell, and Kevin Norwood and freshman running back TJ Yeldon. The offense should improve even further in 2013 behind McCarron’s experience and the addition of new threats Robert Foster, Altee Tenpenny, and Derrick Henry. If there are any areas for concern for Alabama this season, the offensive line does lose its top three (All-American) linemen and hasn’t recruited quite as deeply as we might expect. Many of offensive line coach Mario Cristoball’s players are former three-star recruits that will be pressed in to action this season. Traditionally strong defensive lines at LSU and Georgia, as well as the surprisingly talented Ole Miss line could give the Tide trouble. With the graduation of Dee Milliner and the Geno Smith’s arrest, Alabama has another pressure point at cornerback. However, the offensive line and cornerback positions are still more solid than many of the other top-10 teams. 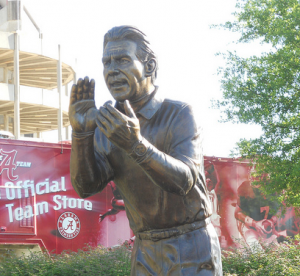 Alabama has a realistic shot at perfection once again behind a forgiving schedule. West win probability: 22.7% (2nd). SEC win probability: 13.7% (2nd). This was an offseason controlled by Texas A&M and Johnny Manziel story-lines, but coach Kevin Sumlin has brought steady growth and consistently entertaining offenses to College Station that justify (most of) the hype. Interestingly enough, Texas A&M has improved despite its atrocious turnover margin, which has been in the red since the 2007 season. If anything might derail the Aggies’ ascent to the college football elite, it might be heavy personnel turnover and limited depth. Sumlin can claim the worst personnel turnover in the SEC, with heavy losses at offensive line, linebacker, and defensive line. The key to 2013 will be the ability of incoming freshmen to fill the holes in the front seven to stop the rush attacks of LSU, and Alabama. West win probability: 8.5% (3rd). SEC win probability: 4.6% (6th). LSU’s season will be built on senior QB Zach Mettenberger, who hasn’t quite exploited his NFL-quality arm in his short starting career. LSU has been consistently good, but only elite in 2011 behind two senior quarterbacks and a dominant defensive line. The Tigers are hurt by the departures of DE Sam Montgomery and Barkevious Mingo, but high-quality recruits should emerge to take the mantle. 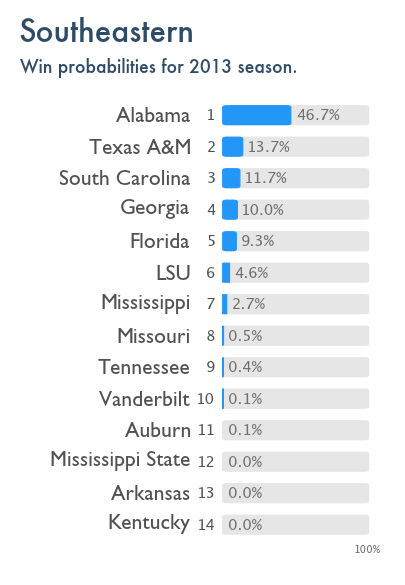 With a 4.6% probability of winning the SEC and 8.5% chance at the Western title, the Tigers are just the sixth most likely to take home the SEC title. LSU probably doesn’t have the stars to dethrone Alabama this season, but its defensive line should match up well with the Tide’s offense to make things interesting. West win probability: 6% (4th). SEC win probability: 2.7% (7th). Ole Miss should be one of the most interesting teams to follow in 2013, with the allure of a still new head coach and an exciting offense. Plus, the Rebels welcome a stellar class of young recruits (including the top overall freshman Robert Nkemdiche, five star receiver Laquon Treadwell, and top offensive lineman Laremy Tunsil), and return a defensive line that has the talent (if not depth) to compete with the top offensive lines in the SEC. The key for Coach Freeze is depth in 2013, as quality depth helps to create consistency. There is perhaps no team in the SEC that is more in need of consistency than the Rebels, who have fielded drastically different teams for the past five years. In fact, the only thing consistent about the Rebels has been their poor turnover margin, which has been negative for the past four seasons. If Freeze can bring any measure of consistency to the program, then Ole Miss should have a 2.7% of capturing the SEC crown and a 6% shot at the Western title. Ole Miss is just outside the “good” group of SEC teams, with almost the same chance to be the Western representative as LSU. Auburn, Mississippi State, and Arkansas make up the bottom tier of the West and the SEC as a whole. All had down years in 2012 and shared terrible turnover margins, but things might get worse before they get better for both Arkansas and Mississippi State. These two teams have almost no chance at the SEC title and only a .1% probability of winning the West. Dan Mullen has one of the more difficult jobs in the country, competing in the loaded SEC West and now vying with resurgent instate rival Ole Miss. Auburn, on the other hand, benefits from a wealth of returning starters and the relative familiarity of first year head coach Gus Malzhan’s offense. Auburn’s team culture suffered heavily under Chizik’s staff, with the team not buying in or giving full effort commensurate with the talent levels on the field. With the Tigers’ talent, new team ethos, and new offensive system, the Tigers should rejoin the good or at least middle-pack teams in the SEC this season. New first string quarterback Nick Marshall will determine Auburn’s ceiling this year, but Auburn still just has a .3% probability of winning the West (.1% overall). Between new head coaches at Kentucky, Arkansas, Auburn, and Tennessee, the relative parity between Georgia, Florida, LSU, USC, and Texas A&M, and the stellar recruiting classes, the SEC races will be exciting in 2013. Besides the (fairly) easy pick for Alabama to return to the SEC Championship, it’s difficult to pick an eastern representative between Georgia, Florida, and South Carolina. As of now, an Alabama-South Carolina bout or Georgia-Alabama rematch is the most probable outcome, but the margins are extremely slim. As for the eventual SEC champion, we return to our original question: Alabama or the remaining 13 SEC teams? Take the field. At 53%, the odds are in your favor.